Product prices and availability are accurate as of 2019-04-19 05:08:11 BST and are subject to change. Any price and availability information displayed on http://www.amazon.com/ at the time of purchase will apply to the purchase of this product. 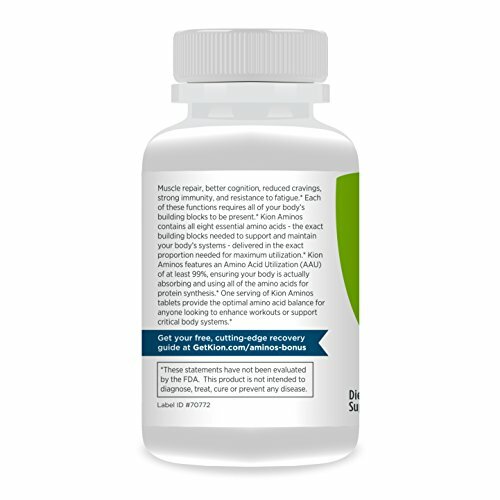 Whether you're looking to stimulate faster muscle growth, recover more rapidly from exercise, become more resistant to fatigue during a grueling workout, or just benefit from additional amino acids in their most absorbable form to support aging or a vegan, vegetarian, or ketosis diet, Kion Aminos essential amino acids (EAAs) has you covered. EAAs are just that: essential. Your body can't produce them on its own and yet they are crucial for supporting and maintaining the muscular, skeletal, enzymatic, nervous and hormonal systems of the body. All of these systems need to be running optimally if you're hoping to get to sleep faster, promote muscle synthesis, enhance recovery from exercise, improve cognition, support your immune system, digest better, and much more. Kion Aminos even contains the muscle building branched chain amino acids (BCAAs) so that you get all of their benefits without risking an amino acid imbalance. 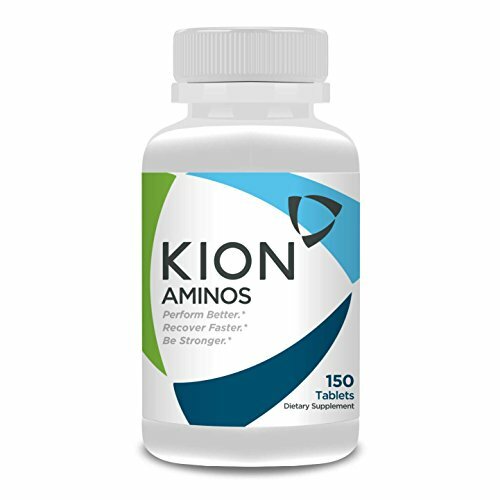 The amino acid utilization of Kion Aminos is 99%, meaning your body is actually absorbing and utilizing the EAAs it needs. 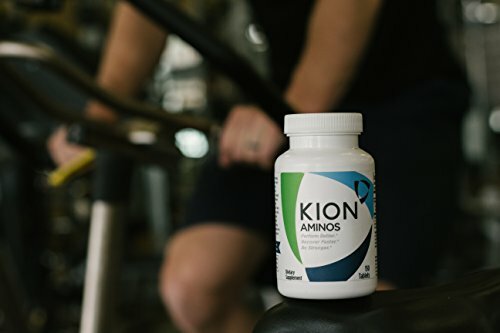 Plus, Kion Aminos are formulated in the exact, scientifically validated proportions needed for maximum utilization and absorbed by the body within 20 minutes. So if you're running from the gym, in need of a quick energy boost, staving off hunger pangs, or in the middle of a long workout, you can easily give your body the support it needs - fast. 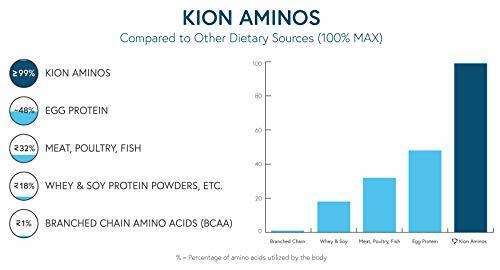 Kion Aminos contains: Tryptophan, Lysine, Methionine, Valine, Leucine, Isoleucine, Threonine & Phenylalanine. And contain 1 gram of EAAs per tablet, with NO binders, fillers, stearates, coating or dye. As a dietary supplement, take 5 grams of Kion Aminos daily. As an exercise aid, take 5 grams 30 minutes prior to physical activity and repeat every two hours of exercise. For maximum absorption, take 20 minutes before or 1-2 hours after other dietary protein and fat. 8 essential amino acids in their most absorbable form for maximum utilization by your body. Stimulate muscle growth & recovery. Improve resistance to fatigue. Absorbed by body in 23 minutes. Crucial for supporting the muscular, skeletal, enzymatic, nervous and hormonal systems of the body. 5 grams EEAs per serving. 30 servings per bottle. Each tablet contains 1 gram EAAs. No binders, fillers, stearates, coating or dyes. Vegan, gluten free, soy free, non-GMO.